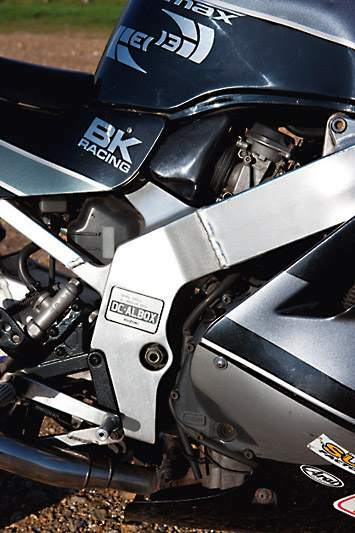 In the early 1990s, 400cc race reps were all the rage. But that was nearly two decades ago. Are these pocket rockets still a viable buy in the secondhand market or simply relics from the past? When 400s ruled the earth Suzuki’s GSX-R400 was the rarest little dinosaur. 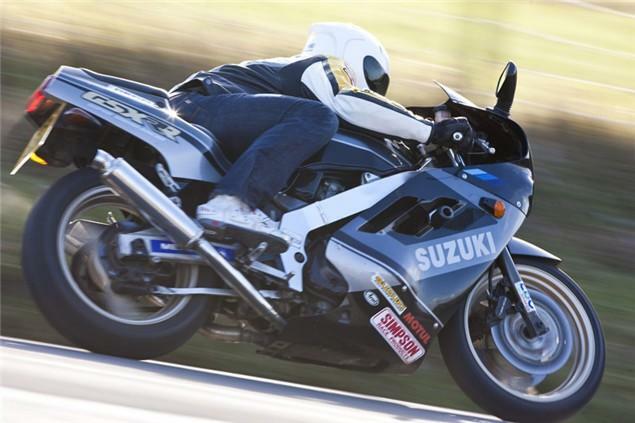 Most riders were won over by the NC30 or ZXR’s looks, the CBR 400’s reliability or the Yamaha FZR400’s race pedigree. The GSX-R was never the fastest 400, it was decidedly retro, seldom raced and consequently slipped into the background. To be fair, looking at this 1990 model, I’m not surprised it was forgotten about, because next to the other three it looks old hat. The whole charm of the 400cc class was that you could get a bike that looked like its bigger brother, at a fraction of the price. This is all very well and good when your bigger brother is the FireBlade, RC30 or ZXR750 – but an old GSX-R750? 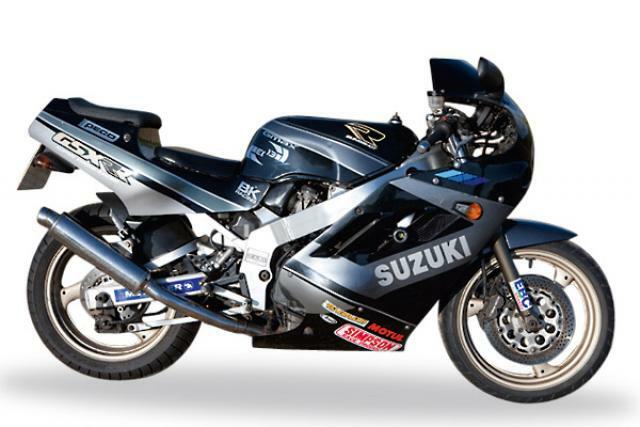 Oddly enough the GSX-R400 is one of the most varied of the 400s when it comes to styles. There are quite a few different models and this one, with its twin pipes, is actually fairly rare. But that doesn’t really set it apart. The twin headlights, bulbous fairing and ugly screen conspire to make it look hyper-dated. 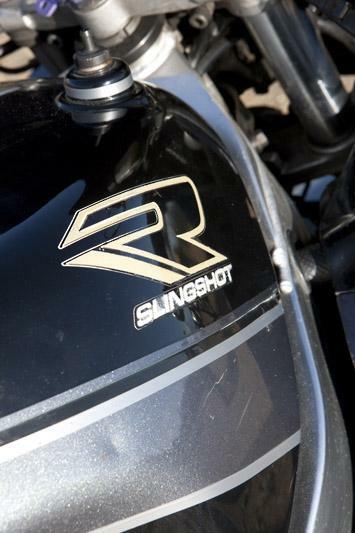 Even on the go the GSX-R doesn’t do anything to endear itself to the rider. The inline four powerplant is spectacularly lacking in any power and seems to make an awful lot of fuss about doing virtually nothing. Below 8,000rpm the little pistons are thrashing up and down the cylinder giving it all they have while the bike seems to be virtually crawling along. Ride it blindfold (not recommended) and you will assume from the screaming engine note that you are travelling at close to the speed of light, but sadly this isn’t the case, well, not until you hit the 8,000rpm mark. Somewhat surprisingly at this point the GSX-R clears its throat, hitches up its skirt, etc, and reveals quite a turn of pace. The motor’s vibrations change from being rough and ready to moderately smooth and the whole bike’s character changes from a buzzing noise box to a fairly rapid machine. It’s an almost identical experience to riding a race rep two-stroke. At first amusing, then irritating and frustrating. It feels the lightest of the four. Flicking the Suzuki through the corners takes virtually no effort and even at a standstill the bike’s weight seems to disappear. But this doesn’t make it a pleasant bike to corner. The GSX-R lacks the balance in a bend of all of the other three – it’s a case of aim it at the exit and hope all goes well. A lot of this is due to tired suspension, but I wouldn’t rule out the simple fact the chassis is a bit crap. Forks like matchsticks tell the story. 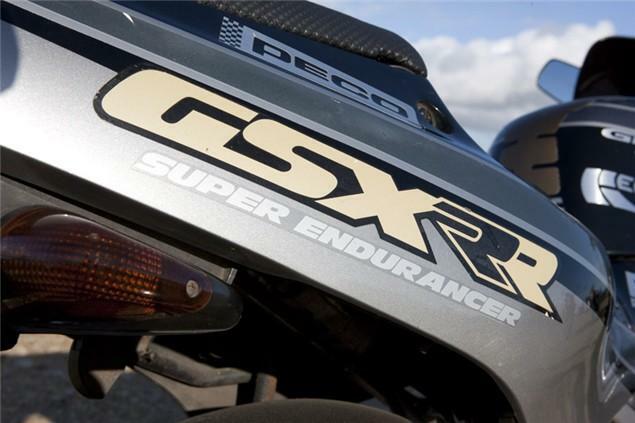 The GSX-R400 is hard to like, or indeed recommend. The look is dated, build quality pretty poor and engine an all-or-nothing frustration. When all of these bikes are similarly priced a nice NC30, CBR or ZXR would be a far better buy, but then again there is a certain odd charm to the GSX-R. I’d advise new riders to steer clear, but if you have a thing for old GSX-Rs and are looking for an entertaining weekend plaything the GSX-R400R would certainly raise a smile. Just be prepared to splash some cash on tidying up the poor finish. The least popular with the buying public of the four 400s on test, the GSX-R has a surprisingly long history, going all the way back to 1984 when it was unleashed on an unsuspecting Japanese public as a huge leap forward in small capacity sportsbikes. The GSX-R brand thrives over here, but the 400 is almost always overlooked in this chain as it was another of this group never officially imported here. A long model lifespan gives a buyer more choice, but as with the CBR400, good examples are few and far between. 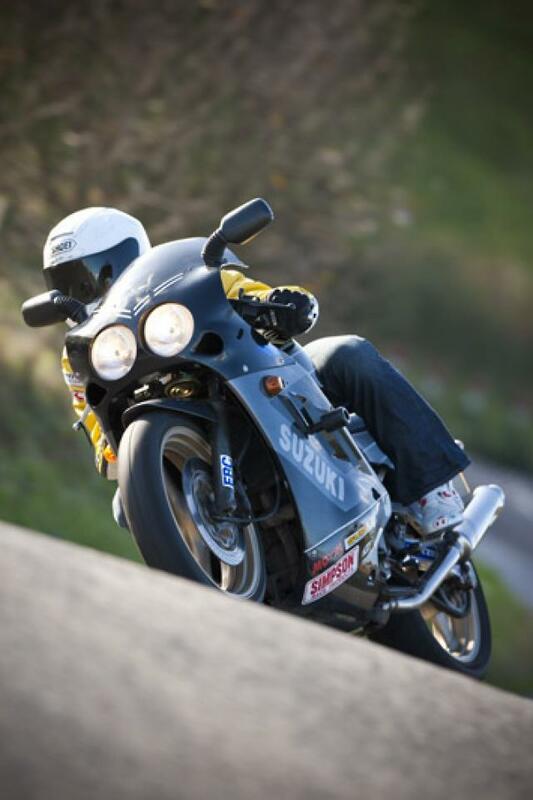 For almost £3000 the bike should be absolutely mint, with as many standard parts as possible. Under a grand will probably pick up a project or a bike that’s been left unused for some time and will require TLC to get running sweetly again. The big question is whether you want the worst of the bunch anyway. Tyres: sticky Pirelli Dragon Supercorsa Pros come in sizes for smaller sportsbikes. Sticky tyres like these can be exploited to the full with bikes as agile as these, and the modest power to the rear wheel makes them last longer than on bigger bikes (Around £200, www.pirelli.co.uk). 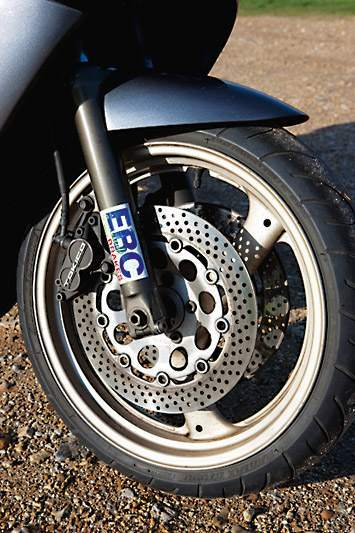 Crash protection: spares can be difficult to come by, especially plastics. Anything that can be done to keep the originals clean and tidy is vital, so R&G’s range of crash mushrooms and sliders are cheaper than having to source new fairing panels (£48.50, www.rg-racing.com). 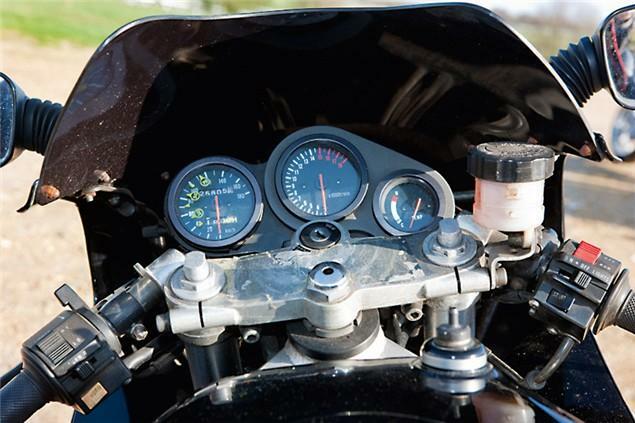 Rearsets: 400s are physically small bikes, so some riders can do with all the help they can to make them more comfortable. Some adjustable rearsets from Beet give a little extra legroom, while also cleaning up the look of the bike. Lower pegs do compromise ground clearance a bit though (£225, www.jap4performance.com). The latest bikes are just over a decade old so should be in reasonable mechanical condition. As would be expected of the 20-year-old bikes, electrical systems can be problematic, leading to battery trouble bike not wanting to start. Carbs can be out of balance or needles/jets worn making the engine run roughly and stalling, or overheating because of dirt or split pipes in the cooling system. All of these problems are caused by the age of the bike but can be remedied with a bit of home maintenance.